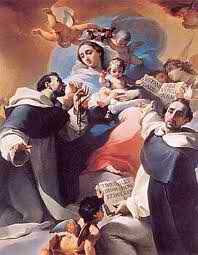 When Our Blessed Mother gave the Holy Rosary in its present form to St. Dominic (founder of the Order of Friars Preachers known as the Dominican Friars) in 1214, the whole of the existing Christian Order faced the menace of being brought down to ruin (cf., Fr. J. Laux, “Church History,” TAN Books) by the Albigensian heresy (the Manichaean error, defeated in the 4th century, chiefly through the effort of St. Augustine, which re-appeared and infected Albi in the County of Toulouse in Southern France). Our Blessed Mother, appearing to St. Dominic, accompanied by three angels, said: “Dear Dominic, do you know which weapon the Blessed Trinity wants to use to reform the world? I want you to know that, in this kind of warfare, the battering ram has always been the Angelic Psalter [the Angelic Salutation, Lk. 1.28] which is the foundation stone of the New Testament” (in St. Louis de Montfort, “The Secret of the Rosary,” TAN Books). The Holy Rosary was given to the Church to aid her in her battle against diabolical deception: error in the guise of truth. We read in verses 3-4 of the 12th Chapter of the Book of the Apocalypse: and the tail [of the dragon] drew the third part of the stars of heaven. The stars of heaven (see also Mt. 24.29): the Rev. Herman Kramer, in his book The Book of Destiny (with the imprimatur of the Most Rev. Joseph M. Mueller, D.D., Bishop of Sioux City, Iowa in 1956) explains that in Scriptural language, the clergy are the stars; they that instruct many to justice, as stars for all eternity (Daniel 12.3); in Genesis the patriarchs, heads of the twelve tribes of Israel, are also called stars (pp. 281-282). The red dragon would draw by its tail one third of the clergy into that apostasy predicted also by St. Paul in his Second Epistle to the Thessalonians (2.3 and DRV note). We see then how Our Lady’s prediction of Russia, if this nation is not consecrated to Her Immaculate Heart as She demanded in 1929 (take careful note of this year as 1917, the year of the apparition of the great sign of heaven, was also the year when the Apocalyptic red dragon appeared – the Woman from May-October, the red dragon in November), spreading its materialist-atheistic errors throughout the world unlocks to us the mystery of iniquity (2 Thess 2.7). The tail: “a symbol of lying and hypocrisy [cf., Isaias 9.15-16]; through false doctrines and principles, Satan will mislead the clergy, who will have become worldly-minded, haughty, hypocritical, obsequient avaricious sycophants” (Rev. H.Kramer, p. 281). We would like to refer the readers to the booklet “AA-1025: The Memoirs of An Anti-Apostle” [published by a Protestant French nurse, Marie Carre, who attended in the 1960’s to an auto-crash victim (a Communist agent commissioned to enter the Catholic priesthood who died but left a suitcase with a set of quasi-biographical notes revealing his commission, along with that of many, many others, and the Communist program of subverting the Catholic Church from within) and who later converted to Catholicism in 1965 after having read the documents] for details on the diabolical doctrines and principles promoted in the Seminaries and the methods and means employed to propagate them. Three years after the Second Vatican Council (or Vatican II, 1962-165), Pope Paul VI, who closed the Council and approved the novelties that emanated from it, said in his December 7, 1968 speech to the Lombard College in Rome: “The Church is in a disturbed period of self-criticism, or what would better be called self-demolition. It is an acute and complicated upheaval which nobody would have expected after the Council. It is… as if the Church were attacking herself” (quoted in “L’Osservatore Romano” – the official publication of the Holy See). * The Holy Father, in his motu proprio on the Traditional Latin Mass, insisted on the use of the “fabricated” New ‘Mass’ as the “norm” and the “ordinary” Rite and yet at the same time upheld the Papal Bull of Pope St. Pius V which decreed the perpetual normative use of the Sacred Traditional Rite of the Mass in Latin and called down “the wrath of God and of the Holy Apostles Peter and Paul” (the Papal Bull Quo Primum) upon those stiff-necked pastors who dared prohibit it and still suppress it. intellectual and moral relativism and therefore in permissiveness, Christians are tempted by atheism, agnosticism, vaguely moral enlightenment and by a sociological Christianity devoid of defined dogmas or an objective morality” (“L’Osservatore Romano,” February 7, 1981). It was said that the Pope who called the Second Vatican Council into session, John XXIII, ordered that the windows of the Church be thrown open to let the “fresh air” in. But his successor, Pope Paul VI confessed: “The opening to the world became a veritable invasion of the Church by worldly thinking” (“L’Osservatore Romano,” November 23, 1973). In writing to a former co-religious, a Dorothean nun, Sr. Lucia, C.D. lamented: “It is painful to see such a great disorientation and in so many persons who occupy places of responsibility… the devil has succeeded in infiltrating evil under the cover of good… in leading… priests and… consecrated souls… into error… They are blind men guiding other blind men” (in “The Whole Truth About Fatima,” Vol III, 750-751). Pope Paul VI, in a startling revelation: “A sentiment of confusion seems to be spreading among the children of the Church, even among the best ones, and sometimes also with the most qualified, who exercise the greatest authority” (Discourse of December 3, 1969). “… Also… the most qualified, who exercise the greatest authority”: Our Lord once gave Peter a most serious rebuke, Go behind Me, Satan, thou art a scandal unto Me: because thou savorest not the things that are of God, but the things that are of men (Mt. 16.23), but the Word of God is living and effectual, and more piercing than any two edged sword (Hebrews 4.12). While the Holy Father has yet to take up once more his powers as the Sovereign Pontiff (see our blogpost, “The Great Tribulation”), exorcise “the smoke of Satan,” and finally consecrate, together with the bishops in a solemn public ceremony, Russia to the Immaculate Heart of Mary (see our blogpost “When Mary Comes (III)”), how can we hope to reverse the current course of events in the Church and the world which alone can be brought about by the fulfillment of Our Lady’s requests at Fatima ? Our Lady “said to my cousins as well as to myself that God is giving two last remedies to the world. These are the Holy Rosary and Devotion to the Immaculate Heart of Mary. These are the last two remedies which signify that there will be no others” (Sr. Lucia, C.D. to Fr. Augustine Fuentes, a Mexican priest then preparing to become the postulator of Francisco and Jacinta’s causes for beatification, December 26, 1957). Let us pray then, not merely recite, the Holy Rosary everyday but according first and foremost to the intentions of Our Lady in giving it to St. Dominic and in insisting upon it in Her Fatima Message: that Our Lord, through the intercession of Our Immaculate Mother and the power of Her Holy Rosary, may spare and deliver us – our Holy Father in Rome whom Satan hath desired to have [and to] sift… as wheat (Lk 22.31), our pastors and consecrated souls, our families and loved ones, and those whom God permits to come our way – from the ancient “diabolical campaign” to deceive (if possible) even the elect (Mt. 24.24). Then, make a consecration to the Immaculate Heart of Mary and wear the Scapular (by being enrolled in the Confraternity of the Our Lady of Mt. Carmel, also known as the Scapular Confraternity; see our pages “Our Lady of Mt. Carmel & Her Scapular” and “Brown Scapular Confraternity”) which is the very sign of our consecration to the Immaculate Heart; practice the First Saturday devotion prescribed by Our Lady (see our blogpost “The Communion of Reparation of the First Five Saturdays”) and the devotion to the Sacred Heart of Our Lord (see our page “Devotion to the Sacred Heart”)- to which the authentic devotion to the Immaculate Heart of Mary should lead us to. And finally, of course, each of us must determine to live now a holy Catholic life by adhering first to truths of the traditions which [we] have received [from the beginning], whether by word of mouth or by… epistle (2 Thessalonians 2.14) and always, everywhere, and consistently taught and defended by the Chair of Peter; avail frequently, if possible, of the Sacraments our Holy Church has administered according to their traditional Rite** – only “[which] grace [can] arm us for the battles ahead and keeps us from the pitfalls which have claimed so many others in this [unprecedented tribulation, cf., Mt 24.21 and our post “The Great Tribulation”]” (Fr. Paul Kramer, “The Devil’s Final Battle,” p. 253). ** The New Rite of Exorcism – a mere Sacramental (like the Holy Rosary and the Scapular), not a Sacrament – and authorized by Pope Paul VI was hopelessly “ineffective” according to the Vatican chief Exorcist, Fr. Gabriel Amorth: “… A blunt weapon. Efficacious prayers [of the traditional Rite], prayers that had been in existence for 12 centuries, were suppressed and replaced by new ineffective prayers” (in a reply to Maria Paci of “30 Days” Magazine, June 2000). What more of the New Rite of Sacraments of the Novus Ordo (or the Vatican II “New ‘Catholic’ Order) with its revised prayers and authorization of the Pope? This entry was posted in Christian Life, Devotions, Sacred Scriptures, The Blessed Virgin Mary and tagged Apocalypse, Blessed Virgin Mary, Brown Scapular, Catholicism, diabolical disorientation, Fr. Amorth, Holy Rosary, Immaculate Heart of Mary, Pope John Paul II, Pope Paul VI, Russia, Sacred Heart of Jesus, smoke of Satan, Traditional Catholic, Vatican II. Bookmark the permalink.